We were led into this project for so many reasons. For me, it’s because I grew up in a rural community among farmers and I’ve always considered the local farming economy to be important and frankly an important part of food security. We are now, as a nation, putting almost as much fossil fuels into our refrigerators as our cars. Every item on average on the American plate has traveled 1500 miles so add up all the items on your plate and you might as well order room service from the moon! That’s an incredible amount of fossil fuel, an incredible amount of carbon emissions going into the atmosphere, warming up the globe just to get a grape from Chile, a tomato from Mexico so I can eat a tomato in January. 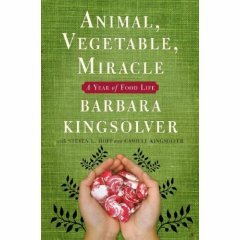 So, Kingsolver embarked on this fascinating journey of creating community, eating locally, eating in season, and growing a lot of their own food. The results of their experiment with eating local are the subject of her new book, Animal, Vegetable, Miracle: A Year of Food Life. The interviewer, Steve Curwood, points out the fact that Kingsolver and family live on a farm and therefore have the opportunity to grow a lot of their own food. But for the rest of us, what do we do? Kingsolver has some great advice. For example, buy at local farmers markets, get a plot at a community garden, etc. I personally volunteer at a small organic farm during the growing season and get a big bag of veggies once a week for my efforts. We also have a pot luck dinner at the end of the harvest day, so itâ€™s like a big community party every week. I also think that you don’t have to go 100% local to make a difference either. You can grow a small plot of tomatoes, or herbs, or buy at a local farmer’s market and not give up the occassional non-local goodie like coffee or imported cheese. 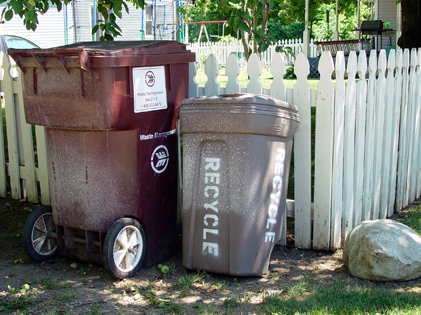 Want to learn more about Kingsolverâ€™s project? You can read a transcript or download the audio of the interview at the Living on Earth website. You can also find out how to grow some of your own food and purchase produce more locally at the Urban Gardening Help website.